The canvas was painted in the period from 1837 to 1857, in oil on canvas in Italy. The artist worked on its creation for 20 years and put all his soul into it. At the core lies the third chapter of the gospel of Matthew. 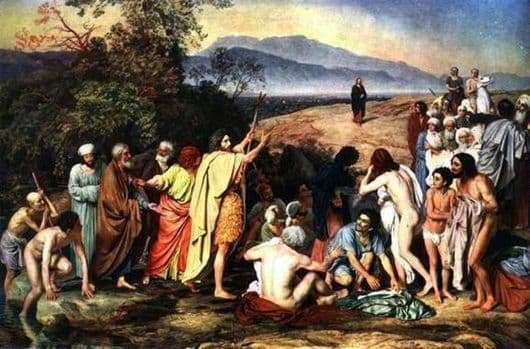 This is not the first canvas Ivanova, which is written on the biblical scenes. “Appearance of Christ to the people” was waited by all who were interested in painting. The canvas was ordered to Ivanov by the Academy of Arts, and immediately after the work was completed. To write it, the artist created more than 600 sketches from life, which Pavel Tretyakov later acquired into his gallery. A year after the work was completed, Ivanov took the picture to St. Petersburg. An exhibition took place at the Academy of Arts in which the canvas made unforgettable impressions on all who could see it. Two months later, the great artist died. He managed to complete the work of his life. Immediately after the death of Ivanov, the canvas was purchased by Emperor Alexander II. He donated it to the Rumyantsev Museum. After its dissolution, the picture was transferred to the Tretyakov Gallery. In the foreground of the canvas are the Jews who came to be baptized in the Jordan River with John the Baptist. But his baptism did not entail absolution. Ivanov portrayed all the characters with exactly the biblical description. John points out into the desert, notifying and rejoicing that the Savior is coming, who bears the truth and gives them new knowledge. John the Baptist is the central image on the canvas. Christ can be considered with detailed study. His face is filled with light, truth, tranquility and grace. Around John there are many people in colorful clothes, among them are future apostles, and the disciples of Christ. In the center of the canvas depicts a rich man sitting with his slave. Ivanov wrote this for a reason, but with a view to the future moral rebirth of man, which will manifest itself after Christ begins to preach the truth. Among the crowd there are negatively minded Jewish priests and scribes. Also on the right side we can see “trembling” – these are semi-naked people who have taken bath and are waiting for the teachings. On the horizon spread beautiful mountains. The area around is rocky and trees grow only near the water. You can see on the hill a crowd of people waiting for baptism and listening to the prophet. The canvas “The Appearance of Christ to the People” became not only the work of Ivanov’s life, but also the historical and religious heritage of our country.